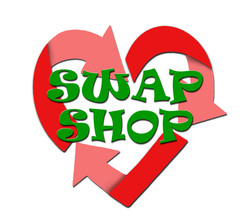 All welcome to our SWAP SHOP – the antidote to eternal economic growth – share, re-use, reduce demand on the Earth’s resources, and reduce waste! Clothes, Books, Household items, Shoes, dvds, games etc. Bring along unwanted items, find something useful, re-use! Clear out your wardrobe and your store room! Find out more about your local environmental group Transition Stourbridge and see if you’d like to get involved with great local projects!